These may be more of Salesforce questions, but any help would be much appreciated - especially with the last question. Our org uses Salesforce NPSP as a database, and Jotform as an online form and payment system for event registration and payments. Jotform is meant to integrate with Salesforce, a feature we are about to explore. 1. Does the payment part of the form integrate with Salesforce? 2. When a form is connected to Salesforce, does it recognize current contacts, and not create duplicates? 3. When a form entry has either a new contact, or new information about a current contact, does it have the functionality to create a new contact and/or update a current contact? 4. 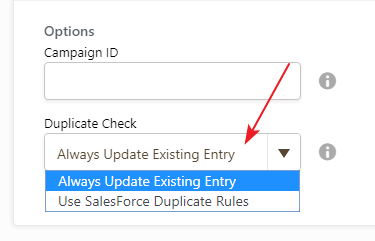 Is there a way in Salesforce to receive a notification that new information is being put in, and I can review and approve it before it is entered into the database? No. The payment field information (i.e., credit card information, etc.) cannot be sent to Salesforce. However, the product or amount billed can be sent to a text field in Salesforce. Unfortunately, the answer is No. Once the Salesforce is integrated to the form, the submission will be sent to Salesforce to lead/account/contact.